Sympathetic in style yet innovative in design, our Vertical Slider presents a whole world of new opportunity in both replacement and new build markets. Developed with extensive consultation from conservation and housing bodies, Interframe can offer its VS product in a variety of colours to ensure the look desired, achieved. 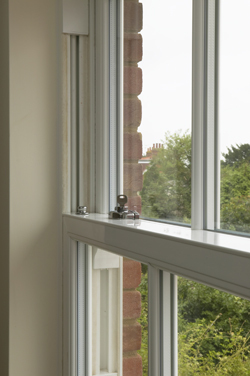 REHAU sliding sash windows are unrivalled in quality, technological innovation and exceptional design. 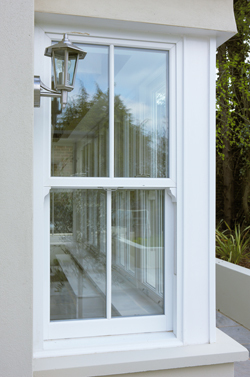 Our vertically sliding windows are designed to incorporate all of the desirable traditional features of a timber box sash window, yet with all of the additional benefits and conveniences of modern PVCu. REHAU vertically sliding sash windows are the most distinctive and authentic looking PVCu sash windows available in the UK market, having been specified on many occasions in conservation areas and used in Grade II listed buildings. Our sash windows are the obvious choice for refurbishment and new build projects. Interframe SW Ltd have gained the accreditations to manufacture our Rehau Heritage Vertical Slider to Secure by Design standards, should you wish for an enhanced security option. For excellent thermal properties and to achieve greater energy savings, REHAU Tritec windows can easily achieve an A rating, the highest possible Window Energy Rating (WER) for thermal efﬁciency. The more efﬁcient your home, the more you save. All REHAU windows can achieve the minimum requirement, of a C-rated Window Energy Rating (WER). For windows this requirement is an overall U-Value of 1.6 W/m2K and for doors 1.8 W/m2K.